How many great walls are there on earth? Bob Dylan would answer "the answer my friend, is blowin' in the wind'. Perhaps it's because of this that mountaineers are always out there climbing some big wall, somewhere. On 23 June 2000 three climbers left from Ljubljana airport: the Italian Mauro 'Bubu' Bole (32), the Slovenian Silvo Karo (40) and his compatriot Boris Strmsek, a journalist/freelance photographer. 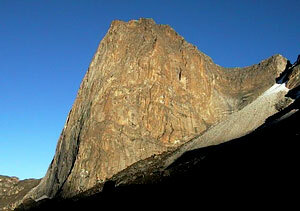 Their objective: to climb the enormous east face of La Esfinge (5325m), situated in Peru's Cordillera Blanca.